When it comes to turning your home into a medieval castle or creating your own throne room, you need the right furniture. We offer a select variety of medieval and fantasy furniture options that will help you embrace your favorite type of decor in a way that cannot be understated. 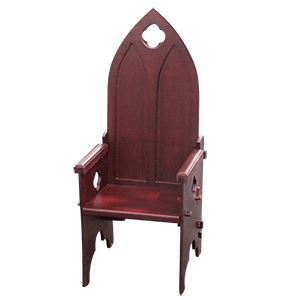 Shop here for our medieval and fantasy seating options and surfaces, including chairs, thrones, stools, tables, desks, and pedestals. From intricately detailed gothic thrones and glass top dragon statue tables to medieval wooden folding chairs and stools, you will find all our different furniture types here. 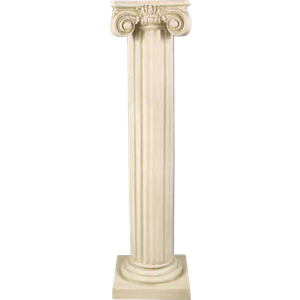 When you want to accent your home with historical, Celtic, fantasy, or gothic style, we have the themed furniture pieces to help you achieve your dreams. Every home needs a place to set something down. Check out this section for all our tables, desks, and pedestals that stand out from your typical home decor. 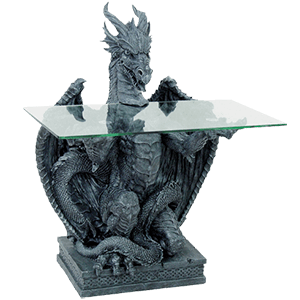 We offer a varied selection of fantasy tables here, many featuring gorgeously detailed statues as their bases and glass tops. Shop everything from medieval, Celtic, and steampunk tables to mermaid tables, gothic dragon tables, and even Roman goddess statue tables here. These fantasy glass top tables, end tables, desks, and pedestals are not only great for bringing your favorite styles to your decor, but are also great surfaces for presenting statue collections or other displays.